It is nice to be in and around remains of old. And it is a nice tower surrounded by some beautiful countryside. In this article we are exploring this nice tower from Kyrgyzstan. This is Burana tower. Burana tower is all the remains of an age old city of Balasugan set at the foot of the Shamshy valley. Burana tower is tall, attractive and contains age old charm. From distance it looks beautiful and to get the real feel you need to walk close to Burana tower. Burana tower is a large minaret not far away from Bishkek, 80 KM approximately. So when you are on Bishkek trip then going 80 KM away to see Burana tower is worth travelling. Mountain behind Burana tower creates special scenery especially when they are covered with snows. Kyrgyzstan as we already know is a nature’s paradise and Burana tower with its own charm adds glory to the beautiful country Kyrgyzstan and beautiful city of Bishkek. Let us see more of Burana tower. The Burana Tower is a large minaret and is located about 80 km east of the Bishkek, near the town of Tokmok. The tower represents grave markers, some earthworks and the remnants of a castle and three mausoleums. 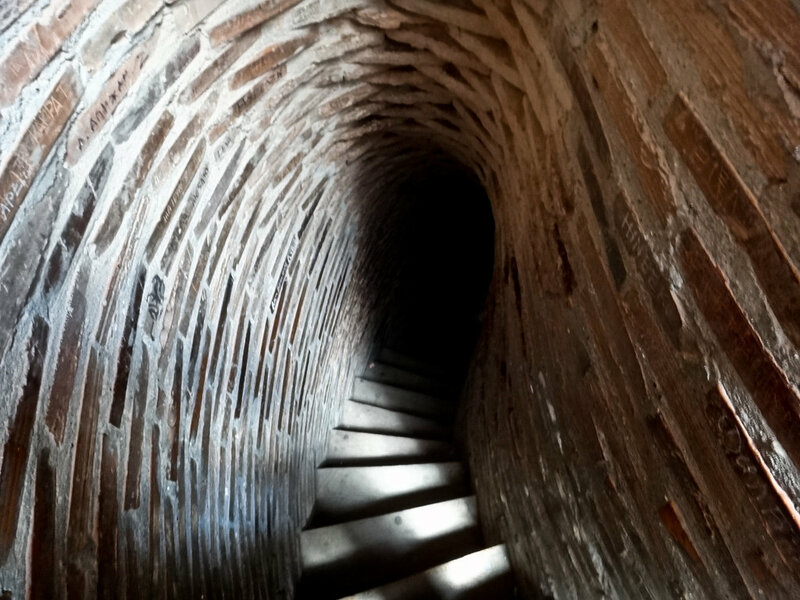 An external staircase and steep, winding stairway inside the tower enables visitors to climb to the top. The entire site, including the mausoleums, castle foundations and grave markers, now functions as museum and there is a small building on the site containing historical information as well as artifacts found at the site and in the surrounding region. 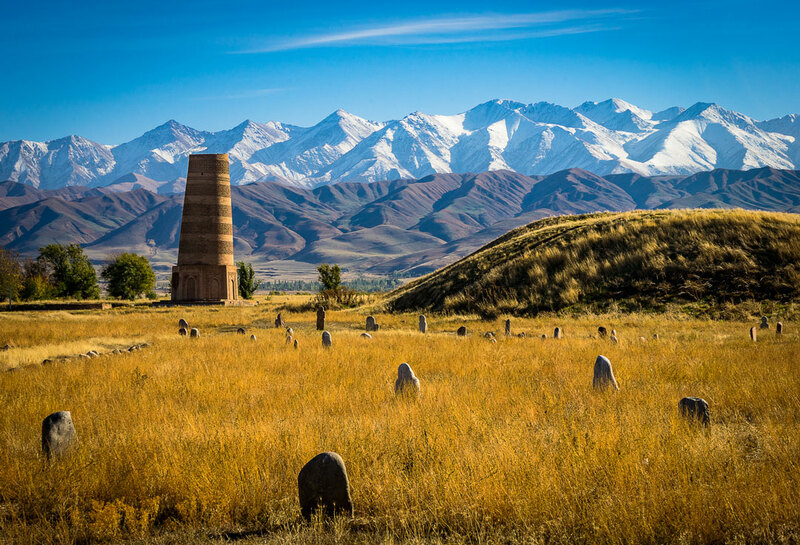 South of Tokmok, and close enough to Bishkek for a day excursion, this tower which is actually a minaret is all that remains of the 10th-century Karakhanid city of Balasagun. As well as the tower and visitor center the site also has an interesting array of balbals – Turkic stone grave markers. Burana tower is not only of 10th century but is also one of the first buildings of its kind in Central Asia. History of Burana Tower is like this. From 10th to 12th centuries, Karkhanids khanate was a great feudal state of Kazakhstan. When in second half of 10th century founders of ‘Karakhans’ who lived in Tien shan conqured large territory here and one of the capitals of the state was Balasagun at that point of time. In that time of Karakhanids they made new towns, centres of big cities were improved and in Balasagun Moslem of religious building were built. Today Burana tower, mausoleum and other buildings which are result of archaeological excavation is witness of that buildup only. Life quality of this town declined over a period of time so people left the place and finally in 15th century this place ceased to exist. Once the height of the tower was 45 m but over the time there came number of earthquakes and it caused lot of damage to the structure and last earthquake in 15th century destroyed the upper half of the tower and so today the height of Burana tower is 25 m.
Museum complex spreads over 36 hectares which includes Burana tower, a mound, a collection of balbals, paintings on stone and a small museum. Inside the tower there is a narrow spiral staircase which leads to the top of the tower and it is said to be original staircase. As mentioned behind Burana tower you can see beautiful mountains. So take Kyrgyzstan travel package or Bishkek travel package and go 80 KM away from Bishkek to visit Burana tower.